FF Global Income celebrated its 3 year anniversary in April. Managed by Peter Khan, this IG-rated global credit fund aims to deliver a high level of income whilst maintaining a positive total return over a full cycle. In this webcast, Alexandra gives an update on fund performance, current positioning and her outlook for the second half of 2016. In the wake of the UK referendum, she will touch on the recent volatility we have witnessed in equity markets and where she is currently finding opportunities. As ever, Alexandra looks for companies that are able to generate ‘growth from within’. She believes that growth driven by internal, rather than external, factors naturally allows companies to have greater agency over their future growth potential, and also provides a degree of insulation from broader market moves. By Friday morning, we should know whether the UK has voted to remain in or leave the EU. As markets digest the result, Paras Anand, Head of European Equities, will share his reaction and consider the investment implications for both the short and long term. Join Paras for this live webcast and pose the questions that matter most to you and your clients. Market volatility has picked up significantly amid heightened political risk. In this webcast Matt Siddle will outline his views on the market and discuss and how uncertainty is creating opportunities for the long-term investor. In this live webcast Paras Anand, Head of European Equities at Fidelity International, will provide his outlook on the key drivers of the European equity markets. Today 'political instability' is at the top of most investors’ minds, despite it having a relatively modest impact on the fortunes of investors long-term. Are these concerns perhaps overblown ? Does this mean that the constrained and indebted governments are having to hand over the initiative for to spurring economic growth to the corporate sector ? These are some of the questions Paras will address during the webcast. 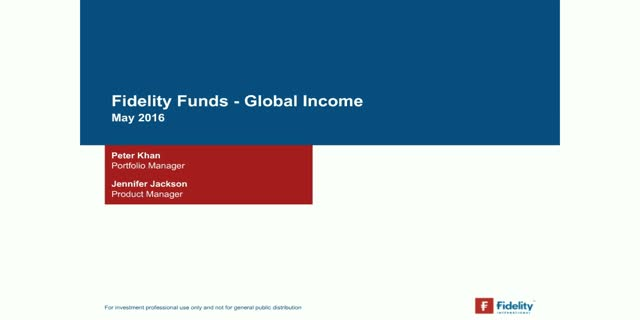 In this on demand webcast Caroline Pearce, investment director, provides her quarterly outlook on equity income. In this on demand webcast Dirk Philippa, fund manager, discusses the performance of the fund and the outlook for the global property sector. Following recent volatility in credit markets, David Simner, portfolio manager for the European Investment Grade franchise, will discuss why he remains constructive on the asset class in 2016. In this live webcast he will remind viewers of his investment philosophy, how the portfolios have evolved through this volatility and current themes across the funds, paying particular attention to FF Euro Short Term Bond and FF Euro Corporate Bond. There will be the opportunity to ask Dave questions on any of the topics covered at the end of the webcast. In this live webcast, Portfolio Managers Nick Peters and Kevin O’Nolan will give an update of the performance and positioning of the Fidelity Global Multi Asset Tactical (GMAT) Funds. They will discuss where and how they are edging into risk in the context of a broadly stable macro backdrop and weakness in equity markets. Summary: Ian Spreadbury and Tim Foster explain the investment philosophy and process of the recently re-purposed FF Flexible Bond Fund. With high uncertainty embedded into the economic backdrop and recent market volatility demonstrating that it is all too easy for investors to get caught out, they discuss why this is the right time for a more flexible approach to bond investing. European equity markets have been exceptionally volatile so far this year. This volatility underlines the importance of careful stock selection, not only in terms of selecting which stocks to hold, but also which ones to avoid. In this live webcast Matt Siddle will discuss where he is finding opportunities in the European market and the positioning of his European Growth Fund and European Larger Companies Fund. Angel will discuss how the recent market volatility has created significant dispersion in terms of valuations and presents investment opportunities at attractive valuations. He will highlight the areas where he is currently finding interesting investment opportunities. In this live webcast Harley Lank, manager of the FF US High Yield fund, will review his process and performance of the fund in 2015. He will also provide an outlook for 2016 including a discussion of key themes for the year. Markets got off to a volatile start in 2016, with concerns around China and economic growth. Eugene will update on Fidelity Global Multi Asset Income’s performance and positioning, while putting recent volatility in context for income investors. It's been a volatile start to the year for global markets with uncertainty over the health of the Chinese economy and further declines in the oil price continuing to dominate headlines. In this live and interactive webcast, global equities CIO Dominic Rossi will consider the investment implications and the role that central banks will play in shaping market sentiment. Following the launch of the Emerging Market Total Return Debt Fund on 29th September, Steve Ellis, Portfolio Manager, will discuss Fidelity’s flexible approach to investing in Emerging Market Debt. Steve will discuss the benefits of a benchmark agnostic strategy while outlining the Fund’s investment process and current positioning. Against an uncertain macro backdrop, Steve will further share his market outlook for next year and highlight where he sees the most compelling opportunities. Following another year characterised by low growth and depressed inflation, the ‘secular stagnation’ scenario in Europe has gained significant popularity amongst investors. Please join us for a live webcast with Paras Anand, Head of European Equities, who will reflect on the Outlook for the European Equity market in 2016 and the potential for a shift from ‘secular stagnation’ to a ‘surprisingly normal’ cycle in Europe in the upcoming year. Paras will also address volatility issues, the role of disruptive business models and their consequent investment implications. There will be also be a chance for Q&A during the webcast. Anas Chakra, Portfolio Manager of Fidelity Active STrategy (FAST) Europe Fund, will give an update on the fund and his market views. He will discuss how he has positioned the fund and explain where he is identifying opportunities, both long and short. The long and the short of it – taking advantage of divergence across the developing world in the FAST Emerging Markets Fund. 2015 is proving to be another year of heightened volatility and divergent fortunes across many parts of the emerging world; falling commodity prices impacting the energy and materials sectors; political turmoil in Brazil and Turkey; reform progression in India and China; currency movements and inflation effects providing headwinds for some, but strong tailwinds for others. Join Nick Price and team as they reflect on how the FAST Emerging Markets Fund has been able to take advantage of many of these events, and hear their thoughts on what the future may hold across the world of emerging market equities. Hear from our portfolio managers and senior investment professionals as they share their insight and analysis on current market developments in our webcast programme. Please email salessupport@fidelity.co.uk to receive Fidelity email alerts including information on webcasts as well as all the latest news from Fidelity directly to your mailbox.